20th Anniversary One-Step Plating 45rpm Vinyl Edition! Already a tremendous figure in her native Singapore, Jacintha has turned heads and ears in this country as well. With an outstanding singing style, Jacintha enraptures you in a perpetual state of musical bliss! 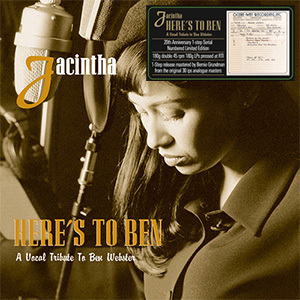 Jacintha debuted in the U.S. with a tribute to the legendary tenor saxophone player: Ben Webster. The songs were specially selected to reflect this premise, i.e. they are mostly great vocal standards and/or ballads that have been recorded by Webster many times and are thus associated with his particular style and name. Some of these songs like Stardust, How Long Has This Been Going On, Georgia and Our Love is Here to Stay, Over The Rainbow are Webster classics. The original album was recorded at the famous OceanWay Recording Studios in Los Angeles, via all-analogue, direct to two-track. The recording was made on an ATR-100 tape machine with BASF-900 1/4’ high resolution tape running at 30ips. Only vintage microphones were used including the Neumann M-49 tube microphone set-up for Jacintha’s voice. The other microphones used (for the musicians) included Neumann M-50 and U-47. The recording and mastering cabling for this session was supplied by Audioquest (Lapis). Mastered by Bernie Grundman direct from the original analogue masters on his highly modified and customized tube driven Sculley cutting lathe. Groove Note is proud to announce the 20th anniversary release of GRV1001 Jacintha Here’s To Ben in a very special One-step plating vinyl LP edition. This double 45 rpm release is a Numbered Strictly Limited Edition packaged in a new deluxe gatefold jacket. All the lacquers are newly cut from the original 30 ips direct to 2 track all analogue stereo master by Bernie Grundman.